April 23, 2013… The Festival Theatre stage will transform into a small Jewish village through the heartwarming tale of hope, faith and tradition that is Fiddler on the Roof. One of Broadway’s longest-running and most celebrated musicals begins previews in Stratford on Tuesday, April 23, marking the first performance of the 2013 season. An affectionately humorous portrait of life in the small Russian shtetl of Anatevka, Fiddler on the Roof centres on Tevye, the village milkman, who finds his values challenged by his daughters’ insistence on following their hearts rather than the dictates of tradition. Gradually, Tevye comes to accept that change is inevitable, but he does not realize that other, tragic upheavals are on the horizon – some that threaten his community’s very existence. The production is directed and choreographed by Donna Feore, who returns for her 19th season at the Festival, having helmed such much loved productions as Oliver!, Oklahoma!, Cyrano de Bergerac and last year’s You’re a Good Man, Charlie Brown. In a playbill built around themes of community, Fiddler on the Roof is a natural fit. Based on the stories of Sholem Aleichem, with book by Joseph Stein, music by Jerry Bock and lyrics by Sheldon Harnick, the Tony Award-winning musical was originally produced on the New York stage by Harold Prince and directed and choreographed by Jerome Robbins. The rousing, unforgettable score, featuring such beloved songs as “If I Were a Rich Man,” “Matchmaker, Matchmaker” and “Sunrise, Sunset,” will be brought to life in this production by an outstanding cast working alongside acclaimed Musical Director Shelley Hanson in her Stratford debut. Two familiar faces from Festival seasons past make a welcome return in the musical: Scott Wentworth as Tevye and Kate Hennig as his wife, Golde. The cast also features Jacquelyn French as Hodel, Keely Hutton as Chava, Gabrielle Jones as Yente, André Morin as Motel, Mike Nadajewski as Perchik, Paul Nolan as Fyedka and Jennifer Stewart as Tzeitel. Joining Ms Feore and Ms Hanson are Tony Award-nominated Set Designer Allen Moyer, Costume Designer Dana Osborne, Lighting Designer Michael Walton, Sound Designer Peter McBoyle and Fight Director John Stead. Themes related to Fiddler on the Roof will be explored through several Forum events, including: Tradition and the Jewish Composer, a concert by the ARC Ensemble (Artists of the Royal Conservatory) introduced by Artistic Director Simon Wynberg; Breaking with Tradition: Fiddler on the Roof and the 1960s Generation Gap, a talk by Marlis Schweitzer, associate professor of theatre at York University; and Fiddler’s Fortunes: The Mighty Afterlife of a Broadway Musical, a talk by Alisa Solomon, director of the Arts and Culture concentration in the MA program at Columbia Journalism School. Support for the inaugural season of The Forum is generously provided by Kelly and Michael Meighen and the Province of Ontario, in partnership with the University of Waterloo, with media sponsorship provided by The Walrus. Support for the Speaker Series is generously provided in memory of Dr. Philip Hayman. 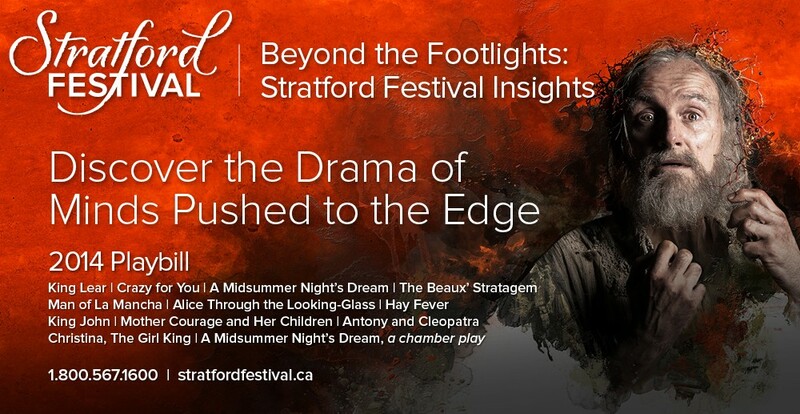 This entry was posted in 2013 Season and tagged Allen Moyer, André Morin, Anita Gaffney, Antoni Cimolino, Dana Osborne, Donna Feore, Donna Feore Stratford Festival, Festival Blog, Gabrielle Jones, Jennifer Stewart, John Stead, Kate Henning, Michael Walton, Mike Nadajewski, Paula Nolan, Peter McBoyle, Scott Wentworth, Stratford Festival, Stratford Festival 2013 cast, Stratford Festival 2013 Fiddler on the Roof, Stratford Festival Blog, Stratford Festival Cast Fiddler on the Roof, Stratford Festival Fiddler on the Roof, Stratford Festival Press Release by Stratford Festival. Bookmark the permalink.